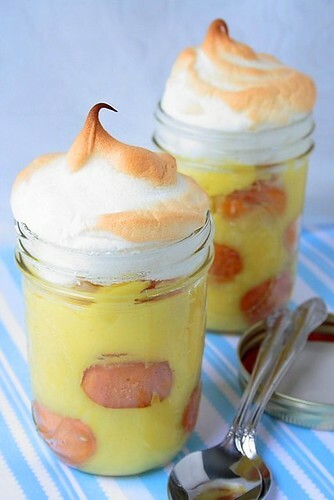 Southern comfort food in all it’s glory, banana pudding served in jars, topped with meringue hats! Just delicious! Kids couldn't wait to get their hands on it!!! I have discovered this recipe in a cookbook Screen Doors and Sweet Tea: Recipes and Tales from a Southern Cook . Definitely a great buy! Pudding: Bring 2 cups of water to boil in heavy bottomed saucepan over medium heat. In large stainless steel bowl, whisk together sugar, flour and salt. Whisk in egg yolks, followed by milk, vanilla bean, nutmeg and cinnamon. Place bowl over pan of water and cook, stirring until mixture is thick and coats the back of a spoon, 12-15 minutes. Remove from heat. Remove cinnamon and vanilla bean. Rinse vanilla bean and reserve for another use. If using vanilla extract, stir it in now. While pudding is still warm, layer cookies, bananas and pudding in 1/2 pint canning jars or ramekins. Preheat oven to 425 degrees. Topping: Whisk egg whites in electric mixer on medium speed until frothy. Add cream of tartar and slowly increase speed as egg whites become opaque. Add sugar 1 tablespoon at a time. Add vanilla extract. Whip until whites form a soft peak. Spoon meringue over warm puddings, sealing it to sides of jars. Bake puddings for 4 minutes or until meringue is puffed and brown. Cool on rack for 20 minutes, then refrigerate for 2 hours before serving. Yield: 8 servings. Cute as buttons. Beautiful photo! I love the presentation in jelly jars! 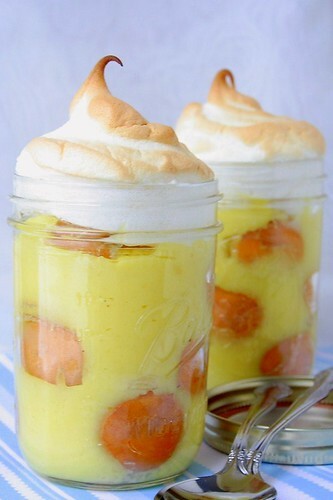 My father would make Nilla wafer pudding like this when I was a kid. This is my husbands favorite! Yum! These are just gorgeous! They make me miss my Southern roots. I must say, you've made banana pudding look more sophisticated than I've ever seen it, and I think it looks spectacular! I met Martha at an event in my home town. She was wonderful! I have this cookbook too. I haven't tried this pudding yet but I've made a bunch of other stuff. I've loved it all! I was so happy to come across this recipe. I hope everyone gives this and Martha a try! these banana puddings are so cute, and def totally yummy I'm sure. No wander why your kids couldn't wait to eat them!. Great green idea to use the jars!. All I can say is "YUM-YUM"!! Looks delicious! I'm definitely going to try this! These look gorgeous! I just stumbled upon your blog and it looks delicious and I am definitely gong to be coming back for more recipes.